We all know that genres, like all things, rise and fall. A game with a particular genre comes onto the scene and makes a big splash (PlayerUnknown’s Battlegrounds with battle royale, for example) which leads to a bunch of other, similar games that follow in its wake (Fortnite and GTA5’s Doomsday Heist DLC), and eventually you have an oversaturated market. In times such as these, I often wonder, “where do we go from here? 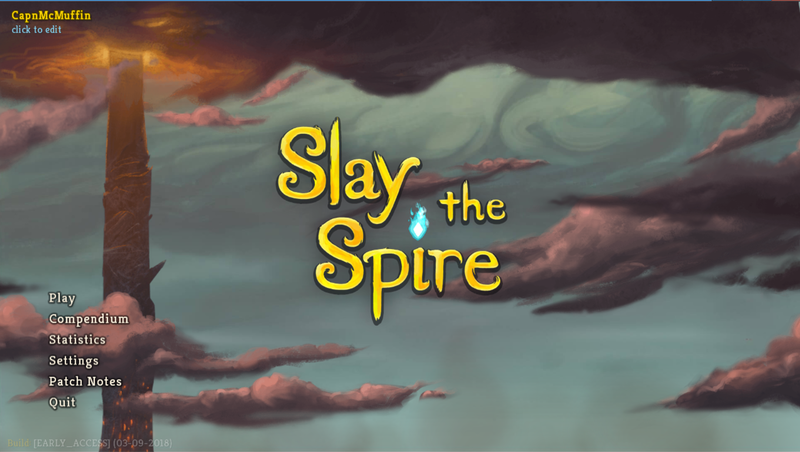 Is there nowhere for the genre to proceed?” and then games like Mega Crit’s Slay the Spire remind me that there’s a whole universe of untapped content just waiting to be exploited: mixing together two completely unrelated genres and making something amazing. 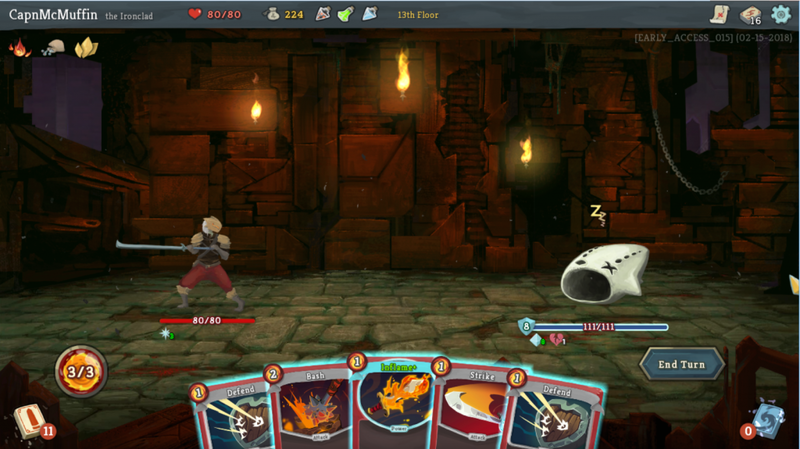 Slay the Spire is a procedurally-generated card game. Just based on those words alone, it seems ridiculous, but it absolutely works. Like all procedurally-generated games, play time is short, only two hours at most to completion across three levels, but those levels vary wildly from run to run. After choosing a character, the player is given a deck of ten cards which includes five Attacks, four Defends, and a special card unique to that character. 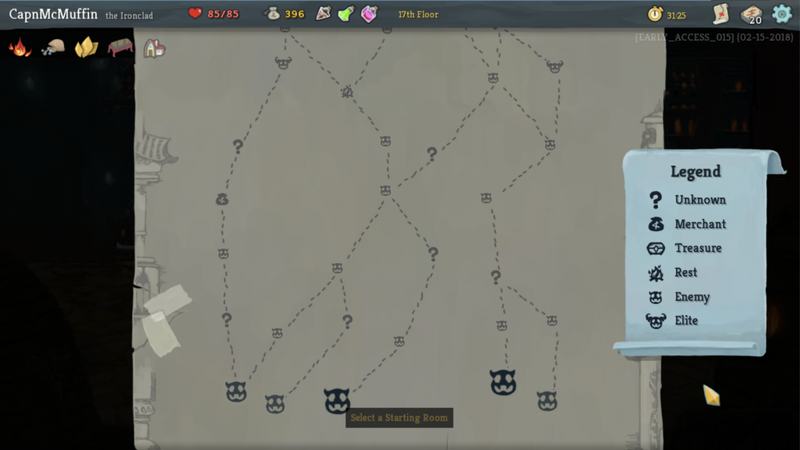 Then the map, a maze of crisscrossing events, comes into full view, and the player must choose one path to travel before facing the final boss at the end. From that moment, the game is on. Most of the game is made up of turn-based battles, wherein the player is given a hand of cards to fight against an incredible array of enemies reminiscent of classic Final Fantasy baddies. When a card is used, it uses up energy and it is discarded. Then, when all cards have been used, the discard pile is reshuffled and the cycle repeats. Enemies also show whether they will attack (and for how much damage), defend, cast a spell, or use a buff so you can plan your next move. And when the battle is won, the player always receives gold and a choice of a new card to add to their deck. But if HP reaches zero, all the cards that were meticulously earned disappear, and you’re back to the original ten cards to start again. So what makes it so immensely fun? Primarily because, like other card games, it executes a simple formula, but all the variables allow for a much more complex experience. Different enemies have different abilities, card types change the battle, you can buy new cards or potions to use at will, and there are events that can boost your deck for a cost whether that be gold or a curse. But what really sells this game for me is the strategy. From the outset you must plan ahead and find the path that best suits how confident you feel about the coming battles. The cards you receive are always semi-random, increasing in power as the game progresses, and you have to make important decisions on how you want your deck to play based on the loot you find. It has that same open-ended deck building aspect that makes me love card games like Magic the Gathering so much; I find that every run my deck is completely different and focuses on a different strategy. Sometimes, I want to focus on chipping the enemy with poison while other times I want to go full berserker mode and crush my foes with buff after buff to my attack strength. And I absolutely adore it. 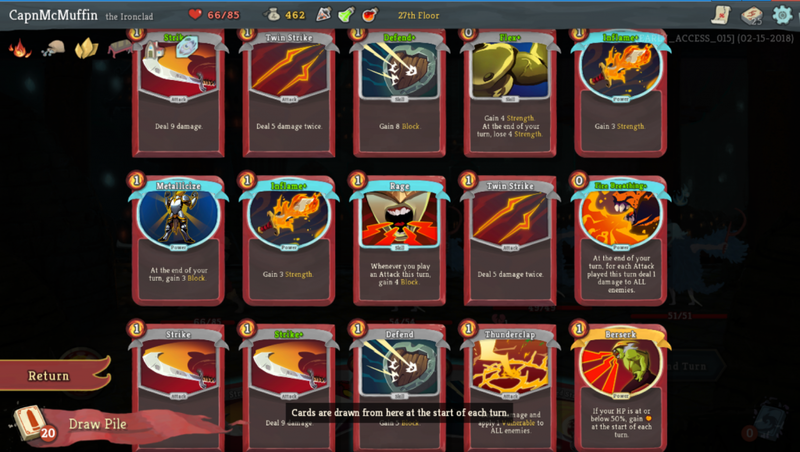 Mega Crit’s Slay the Spire offers that beautiful factor of endless playability with a pick-up-and-play style that feels just like a card game sans the need for spending too much money to get the best cards. It’s only $15.99 USD on Steam, and for being such a fleshed out game that runs like a full release, it’s only in early access, so we can expect more updates, new features, and a lot more polish in the future. A combination of two genres that work wonderfully with each other, and a simple concept with endless complexity, though the early game does get somewhat stale after a few consecutive plays. All in all, great game for a great price.